Whether your kitchen is big or small, every inch inside there is valuable real estate that deserves to be utilised well but you might be surprised at how messy your kitchen is right now. If you really want to spruce up your kitchen and keep things organised then try these few tips we have in store for you. You might have a limited amount of space in your kitchen and really want to maximise it so that you have all the real estate you need for your stuff. You can actually do so by transforming your vertical space in your shelves by using these shelf risers so you will always have room for the things you love. Another great way to create more space in your kitchen is to use storage bins to keep things organised, especially if you have deep cabinets like this. They’re great because you don’t always have to reach to the back to get the stuff you need. In every Malaysian home, you can bet that there will be lots of Tupperwares, takeout containers or any other form of food containers stacked in the shelves just waiting for us to use them. However, we tend to store them rather haphazardly which can result in lots of underutilised space or even lids going missing so make sure you keep them neat. Look around your kitchen and you may find that it looks like every empty space has already been taken up by something but if you take a closer look, there are actually plenty of under utilised spaces. These include the side of your cabinets, above your sink or any gaps you have between the cupboards. Colour coordination is actually a great way to display all your stuff without making it look messy and as an added bonus, it’s within easy reach too. You don’t even have to buy any fancy organiser in your kitchen for this, just group them according to colour. There’s always a lot of slim items in the kitchen that can actually be stored vertically to maximise the space in your kitchen and keep it looking neat. 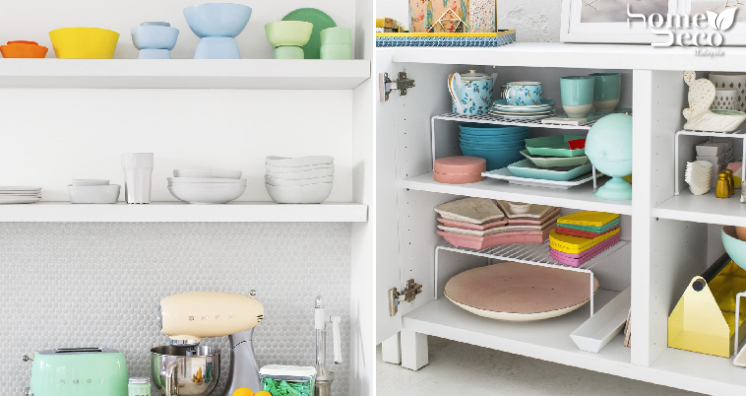 Items such as lids of pots and pans, boards and baking sheets can be easily stored this way.